Published: Nov. 4, 2018 at 04:13 p.m.
New York Jets quarterback Sam Darnold throws INT to halt comeback hopes. 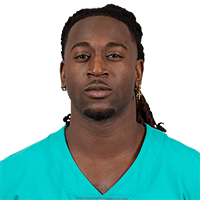 Published: Dec. 18, 2016 at 12:40 p.m.
New York Jets punter Lachlan Edwards has his punt blocked and Miami Dolphins safety Walt Aikens takes it to the house for the touchdown. Published: Aug. 12, 2016 at 09:12 p.m.
Miami Dolphins linebacker Spencer Paysinger picks up New York Giants QB Ryan Nassib's fumble, returns it for 24 yards.